Texas running back D'Onta Foreman is earning more playing time, but remains the backup to senior Johnathan Gray. Charlie Strong continues to talk about a burgeoning identity for his club, a physical, predominant rushing team that is going to control the line of scrimmage. That’s the team that showed up for work a couple of weeks ago at the Cotton Bowl and surprisingly manhandled the Oklahoma Sooners. And once again proving to be a hard-nosed runner was 6-foot-1, 241-pound sophomore D’Onta Foreman. For a second consecutive week, Foreman eclipsed 100 yards. He was one of the few bright spots against TCU when he hit the century mark for the first time in his career. His 81-yard breakaway against the Sooners, helping him to 117 yards in the huge 24-17 win, put the Longhorns deep in Oklahoma territory as the third quarter expired, and led to a touchdown to push the lead back up to 14 points. Foreman had just nine carries against Oklahoma after getting 18 against TCU when the game was well out of hand. 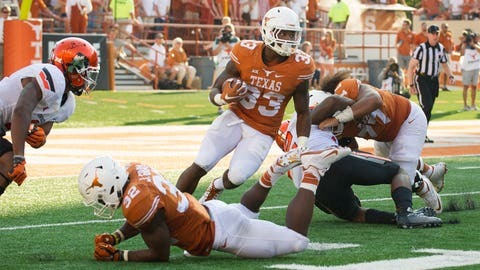 It begs the question if Foreman will be featured more in Texas’ running game as it apparently will try to carry through with this vision of becoming the schoolyard bully? Perhaps gradually. Strong said Monday during his weekly media conference that Foreman will continue to split carries with Gray, who is finally healthy this year and consistently approaches his job the right way, which has earned Strong’s respect. Yet it’s been Foreman with seemingly the upper hand on the field. He is now second on the team behind quarterback Jerrod Heard in rushing with 328 yards, about 48 more than Gray on 22 fewer carries. Next up for the Longhorns is Kansas State on Saturday, and another opportunity to continue the momentum created with the Oklahoma win. As long as Texas manages not to meltdown early as it did at TCU, the rushing attack should get ample opportunity to get revved up, and that should mean a good chance to see Foreman give the Wildcats’ defense a changeup with his speed and size.